Here’s something interesting: the idea for the first Compaq computer was hatched at my favorite coffee hangout place. Egad, House of Pies has a website! I pretty much bring all my out-of-town guests to House of Pies at one time or another for marathon nocturnal conversation. I’ve had great brainstorming sessions/soul-searching conversations/rants/you name it! In the late 1980’s I spent almost all night there with a girl I had a crush on before she would leave the country. It was a sad glorious night. Later on, in 1995 before embarking to Peace Corps, my entire family brought me there for one last time. I usually go there regularly after seeing plays at University of Houston. Lately I’ve tried to cut down on calories, so I usually just eat half a pie, bringing the rest home for the next day. 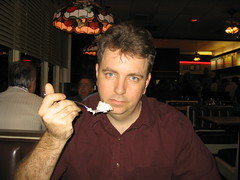 At first I used to eat nothing but the keylime pie. It was delicious, but the problem was they ran out every night. I would pretend to be angry, and one day (a birthday of mine) a friend of mine arranged for a piece of keylime pie to be set aside specifically for me. But on that day I instead opted for amaretto cheesecake, something that infuriated my friend to no end. (Amaretto is currently my favorite). House of Pies was the inspiration for the movie “Reality Bites” and Houstonians affectionately refer to it as “House of Guys” (because of the high number of gay people who hang out there). Parking there used to be awful, but now you can just park at a nearby retail store parking lot without problem. Anecdote: although House of Pies finally is a smoke-free environment, for a long time you had separate sections for smoking and non-smoking. When you arrived, they would put your name on a list, asking, “Nonsmoking or first-available?” I am a nonsmoking fanatic, so I always insisted on nonsmoking, much to my companion’s chagrin (it usually doubled the amount of time we had to wait for a table). Once, when I put my name on the first available list (“20 minutes”), I noticed that people on the “first available” list were being seated immediately. While waiting, I ended up going to the restroom and taking an informal inventory of the customers. I discovered that at the time there was not a single Smoker in the place. Not one. If any of you readers outside Texas (or Houston) ever make it to Houston, don’t forget House of Pies. Also, give me a call or send an email, and I might be able to meet you there. On another note: Wynia, on a recent podcast with the Writing Show, reveals that a surefire way to understand someone’s personality is to watch him eat a piece of pie. Here’s a few photos I took at House of Pies. .